Bio: Katie currently resides in Youngstown, Ohio, where she was born and raised. Beginning at age four, she studied many forms of dance including tap, ballet, jazz, acrobatics, and modern. She took her first gymnastics class at age ten and immediately fell in love with the sport. She competed in Levels 6 through 9 with Youngstown Gymnastics Center until she graduated from Ursuline High School in 2003. She then studied Interior Design at Kent State University. At age 26, Katie discovered the art of Hoop Dancing, which motivated her to explore new career paths. She began teaching Hula Hoop Fitness classes, as well as TRX, Cardio Fitness, Power Barre, Indoor Cycling, Children's Fitness, and also got her ACTION Personal Training Certification. In 2014 she co-created Infini-Tribe, a Hula Hoop Performance Troupe based in Youngstown, Ohio. Outside of the gym, Katie has a huge passion for crafting and manages her own online custom crochet business. Motto: "Take that step you are afraid to take. You won't regret it!" 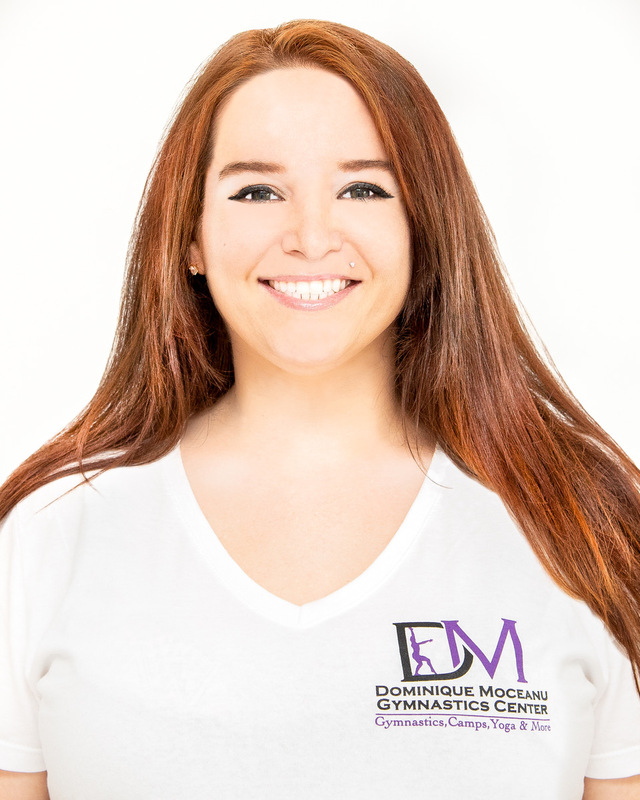 Why I love teaching : I am thrilled and honored to be a team member of the Dominique Moceanu Gymnastics Center! I want to spread the love of gymnastics to future generations so they can enjoy the sport as much as I did as a child. I’m excited to be involved with a facility that promotes a positive and inclusive atmosphere. Fun Fact: I have two cats named Louie and Jester, and both of them can also perform tricks! Louie can spin around in circles on his tippy toes, and Jester can jump through hoops!